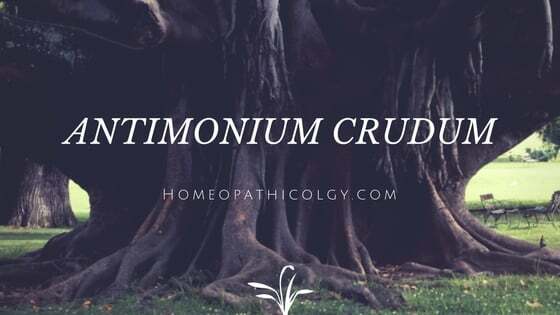 ANTIMONIUM CRUDE does not often use, but when it is indicated by some very marked characteristics no other homeopathic remedy can cure so quickly. Conditions and symptoms of this remedy are most apt to be found in the diseases of children, for whom it often proves indispensable. The mental symptoms are unique and should have pre-eminence in prescribing Aantimonium Crudum. Know more about What is Homeopathic and how does homeopathy work? The peevish, sulky disposition is carried to the extreme so that the patient can not bear to be touched or even looked at. Vexed without any cause; will not even reply or speak to attendants. The white-coated tongue is a very sure guide if the mental symptoms correspond, and such conditions as may develop with gastric and internal derangement from eating candies and sweets, with nausea and vomiting of ingesta. The absence of thirst and the white tongue will distinguish -Anti. c. from Ars. Catarrhal inflammation of stomach and bowels, with distention. Find Complete A to Z Homeopathic Remedies List. Cough, and dyspnea with loss of voice, i whooping cough and asthma. Following coryza, with rawness and crusts about the nose and lips. Colds after bathing. The keynote is generally found in the disposition. Do you have other Symtoms? Find Homeopathic Medicine List with disease. Conditions—Worse, after eating; cold bath; the heat of the sun; from being touched or spoken to. Better, from rest, open air, and warmth. Compare—Chamomilla., Cina, Nux Vomica, Pulsatilla, Ipecac, Sulphur.